The process of building value begins early in the buying journey. Sales professionals talk a lot about building value, but the truth is that value looks different to everyone. 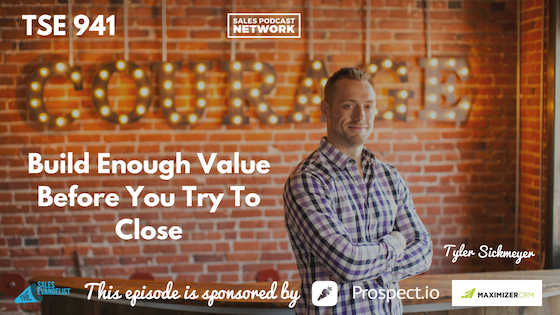 On today’s episode of The Sales Evangelist, we have a candid conversation about value — and why it’s important to build enough value — with Tyler Sickmeyer, founder and CEO of Fidelitas Development. Because people are different, they will place different amounts of value on things. This truth shows up all the time on TV shows where people go garage sale hunting or “picking.” One person just wants something out of the house, and it’s a bonus if they can get a little money out of the deal. The other person recognizes an opportunity to buy something of value and flip it to make money. Value is a matter of perception. Your product or service probably won’t be a good fit for everyone. Tyler’s company recognizes that, and Fidelitas uses it to field the right sales team and to find the right clients. To avoid wasting people’s time, the team strives to have honest conversations early in both the hiring process and the buying process to make sure the fit is a good one. The team recently passed on a project that was beyond the scope of its expertise because it didn’t want to tackle work that would create headaches and potentially tarnish the brand. Tyler believes that acknowledging limitations and pointing the client in the direction of a team who is a better fit is a form of building value. By saving the prospect a lot of time and headache, they built value for the prospect. Any time you take on a project that isn’t ideal, you’re missing an opportunity to find something that is ideal because you have a finite amount of resources available. When you ignore your instincts and take on clients that you shouldn’t take, it creates headaches for your team and can bring toxicity to your culture. Tyler found that those tended to be the lowest-paying clients who treated his people poorly, so they’ve learned now to fire those clients if they misbehave. Better yet, they have very clear conversations ahead of time to set expectations. When you have a sales team that is incentivized incorrectly, a team that is trying to hit unrealistic numbers or that has been set up for failure, you’ll damage your brand. If, for example, you accept a client that isn’t a good fit, but you justify it because you want the sale, you’re entering dangerous territory. 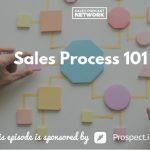 If the sales process goes badly, they’ll tell other people. Though you might eventually refund their money to compensate for the trouble, they won’t get back the time they lost in the process. The result will often be people who are anti-evangelists to your brand because their experience is so bad. One of the big questions to ask is what happens after the sale. Once we’ve made our first payment and committed to this purchase, what will the relationship look like? Look for someone who is invested in you after you swipe your credit card. Things will always go wrong because we’re human. But when something does go wrong, what will the process of fixing it look like? Who will have the decision-making power to make things right for us as customers? Don’t leave your customers feeling as though they are shouting into the wind. Treat your customers well. Remember this overall: if your product or service doesn’t perform well, and it makes me look bad in front of my clients, you’re likely going to have a big problem on your hands. What do our wins look like? What does a win look like for you and for your boss? Those aren’t always the same thing. Sometimes you’ll know what’s needed for the brand, but your boss will need vanity metrics that are different. Being a good partner is doing both things. Do you want a vendor or a strategic partner? If you’re simply looking for a vendor, Fidelitas probably isn’t the right partner for you. If you’re simply looking for five Facebook posts on a regular basis, you can most likely find this service cheaper somewhere else. Think of it as two kinds of agencies: a Wonderbread factory and an artisan bakery. One team will offer you off-the-menu options with add-ons to address your pain points. The other will customize a strategy and solution; a customized approach that positions it as your strategic partner. If you just want a Facebook page or a website, you can find that somewhere else. We’ll help you understand why we’ve chosen the strategies that we’re using. Fidelitas wants to work with clients who value their insights. Focus on strategic partnerships rather than just vendor relationships. Figure out how you can add value. Adding value includes things like taking your team on a road trip to visit the client and get to know their needs. You aren’t being paid for that, but it will help you address their pain points. If you can give something that the client didn’t pay for, and exceed their expectations with superior service, you’re providing value, and you’ll take your relationships to the next level. 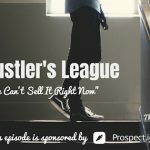 You can find Tyler’s podcast, Lion’s Share Marketing Podcast, on iTunes, Spotify, Google Play, Stitcher, and anywhere that you’re listening to this podcast. Learn more about marketing wins and brand marketing strategies. You can also find him on Twitter and you can email him at Fidelitas’ website.